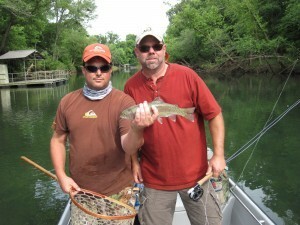 We had an amazing day of fly fishing on the Little Red River with Mike and Craig. According to these two Texas anglers they caught more trout last Tuesday than they had ever released in one day. The water continues to be low and the fish are definitely turned on! We had beautiful weather and almost non stop action on size #14 RG/PT Cruisers. The Caddis hatch is about over but we are beginning to see good numbers of BWO’s. Mike and Craig are already planning another trip with Bo and I in June. It is certainly shaping up to be a great spring of fly fishing on the Little Red River.